A local man, who happens to offer psychic services, suffered a debilitating injury in an accident. As he is beloved by the community, several friends decided to help him with his medical bills and throw a weekend-long bash. Last night they had a dinner and a local band performed. Today, in honor of his talents, local healers, tarot readers, and shamans came together to throw a holistic fair. They donated their services and the money they made to their rehabilitating compatriot. I felt this was wonderful. Many of the practitioners lowered their prices significantly to encourage people to try out something new and to insure that they would have some money to give to their friend. There were numerous local practitioners there – some I had never met before. Whispering Angel was present from Watertown. She was doing cleansing foot baths and selling locally made runes. We chatted briefly about them and how thrilled I was to see and learn about so many like-minded individuals in the community. I had a ten minute chair massage which was absolutely divine. I also had a chakra cleansing and reiki session with Lisa Smith of Magic Touch Healing and Energy Work. It’s been awhile since I’ve had reiki done and this is the first time by a grand master. The heat and energy coming from her was intense but very soothing. She felt a lot of energy about my jaw where I had my teeth removed. We also talked at length about my reproductive organs and having children in the future. The most interesting thing to happen occurred when she was opening and cleansing my chakras. As she passed over my third eye, it started to pulse. That happens to me from time to time – usually just before entering a deep meditation or starting to trance. I was interested in having my cards read by the shaman but she was busy and I decided to call it a day. I went across the street to an antique store to browse. 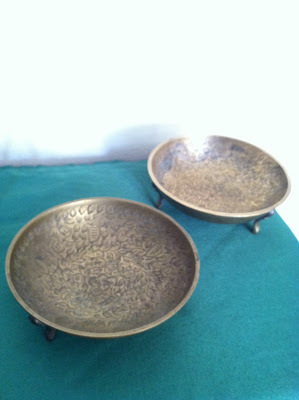 I left with these lovely brass bowls which I plan to cleanse and use on my altar for offerings of incense. Tonight, I’m looking forward to an evening with some crafty gals at a cafe in Watertown. I’ve been experiencing some heavy cramping and menstruation this week, so I could really use the feminine bonding. Sounds like a fun and interesting time. Nice find on those bowls! I love going to antique stores too. They are like museums where you can buy the displays. It makes me all tingly and fuzzy when I hear of such amazing communities pulling together for one of their own.